Together with the Hub San Francisco, and Intersection for the Arts we invite you to Compathos Film with Social Impact Director Series which presents new, critically acclaimed releases, undiscovered gems along with established award winning films which account for a range of environmental and humanitarian impacts. This year's goals are to not only illuminate educational films and issues, but the entrepreneurial artists that are standing in the gap with their amazing talent, energy and vision. The majority of screenings will be followed by a discussion with the director, special guest or discussion leader. This year's theme: "At What Cost?" topics include consumption and waste, social and economic justice, corporate accountability, war and reconciliation, human spirit / inspiration, human trafficking, and the global orphan crisis. Various themes will correspond with exhibits at Intersection 5M Gallery, such as the 2010 multi-award winning Wasteland on September 23. THESE FILMS ARE SAN FRANCISCO PREMIERES / PRE SCREENINGS BEFORE THEATRICAL RELEASE! Our fall program rocks with some fun things planned, so don't forget to watch for monthly screenings and mark your calendar for these exciting events. Seating is limited. Newly released, narrated by Martin Sheen and endorsed by Desmond Tutu, Return to El Salvador is a compelling story of vibrant Salvadorian individuals and communities among the intricate geo-political systems that have profoundly impacted their lives. While documenting the country's 12-year-long civil war, it asks why 700 Salvadorans leave their country every day while reminding audiences why the fate of these people is intimately bound to the recent history of the United States. It also tells the story of the tragic death of activist Marcelo Rivera asking how it relates to Canadian mining corporations. This new release has been instrumental in introducing legislation for corporate accountability in Canada. Compathos Interview / article here. 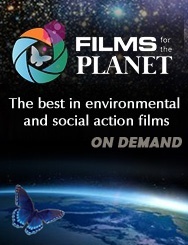 Through this 2010 award winning documentary we are taken on a surreal journey into a world we can scarcely imagine- yet into a world that is becoming more common that we think. We follow the journey of artist Vik Muniz to his native Brazil and the world's largest garbage dump, Jardim Gramacho, located on the outskirts of Rio de Janeiro where he photographs the forgotten people or "catadores" -- self-designated pickers of recyclable materials. Through his journey we discover beauty and hope amidst hardship, the dignity of the human spirit, along with fading boundaries through visionary art and sacrificial giving. Lucy Walker (Devil's Playground, Blindsight) has great access to the entire process and, in the end, offers stirring evidence of the transformative power of art and the alchemy of the human spirit. This film has won 17 awards including both the Audience and Grand Jury for Best World Cinema Documentary at Sundance and has recently been nominated for the Academy Awards Best Documentary. Special thanks to our partners for thematic collaboration: The Redford Center, co-presenters Intersection for the Arts and their exhibition at Intersection 5M: Art at the Dump: Twenty Years of the Artist in Residence Program at Recology, XS Project, The Invisible Institute and Love Light and Melody. Tom Shadyac - director of huge comedic blockbusters (Ace Ventura, The Nutty Professor and Bruce Almighty) finds his more serious and introspective side as a personal accident causes him to not only seek life's meaning but question the "American Dream." Tom interviews renown sages, scientists, thinkers and doers in his quest to find another side to human nature. If we can examine our culture of consumption and find a new paradigm of connectedness and kindness, we will be truly richer for it. This moving, inspiring and award winning film was a treasured favorite at Telluride Mountain Film Festival, where it premiered in May.